If cycling is right up your alley but you don’t much care for getting wet, direct your attention this way for a concept design that may just pique your interest. 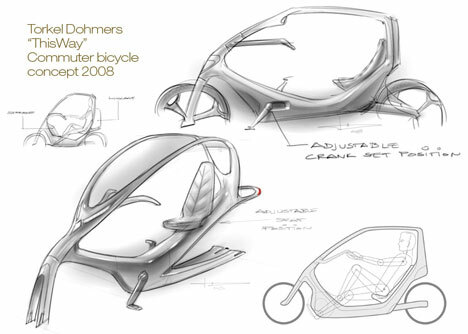 Called the ThisWay Recumbent Bicycle, it is an interesting design that looks much like a covered motorcycle. Unlike many recumbents, it settles for a more elegant seating position that is similar to a cruiser-like arrangement, only with peddles instead of foot pegs. 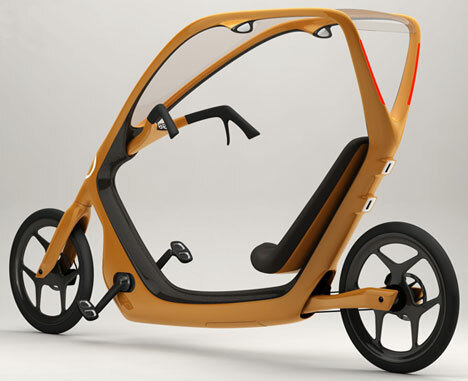 ThisWay was designed by Torkel Dohmar and came top spot in the Commuter Bike For The Masses design competition. 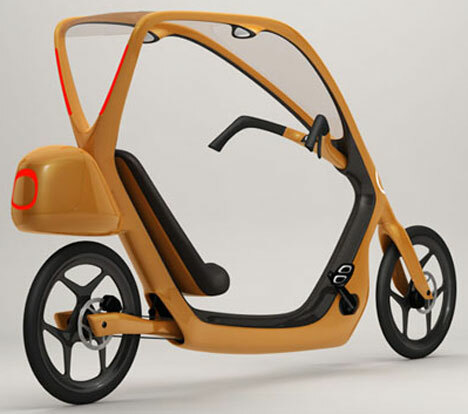 The style was influenced heavily by car and motorcycle design in an attempt to make the transition to bicycles easier for those accustomed to motored transportation. The cover at the top provides weather protection, which should be especially useful in Europe with all the rain – but unfortunately omits consideration for the cold, which is probably a more important factor. The few madmen who cycle here in London in winter all seem to have ski masks on their heads, presumably to lessen the wind-chill factor. This design may help with that to some degree however, thanks to its small windshield. The frame is supposedly very lightweight (12kg), consisting of composite materials and hydro-formed aluminium and comes with front and rear LED lights and a rechargable battery to power them. Now, if this could just be converted into a backpack bicycle, I reckon we’d all want one. He! Looks very tasty but I think it won’t protect a human being from side-rain – like, when you ride a bicycle in windy weather. It’s really nice to see this concept is in the works! I actually thought this would have been on the market by now. I like the clear plexyglass idea but wouldn’t it be more desirable to extend it to the sides, even as a door? To be on a bicycle and be completely enclosed, unaffected by the elements would be a dream come true. Hi nice concept. Few comments from an everyday commuter cyclist. 1) Handlebar is very high for a long ride — your arms would be more relaxed if the grips where somewhere near the legs. 2) The windshield will add significantly to an overall windage which is fatal for a one man-powered vehicle. I’d consider not having a windshield at all as the other commenters are right that it won’t be able to protect the rider against rain. I love this! I would like to put an electric motor on it and sell it as a commuter bike in USA on my web site http://socalelectricbikes.com Will you please contact me to discuss a test market here in Murrieta, CA!!!? I’m afraid it’s just a concept at this stage Vincent, but it sounds like you might have the resources/contacts to make it a reality! Best of luck, Mark. « Western Digital 2TB Caviar Green Launches, Sets Industry First.